This dish is perfect for spring. I make it every year when the fresh peas first come onto the market. You can substitute frozen peas, but you won’t get the same result. The lettuce is a French touch — and explains why this dish is called à la française. It is typically made using Boston lettuce, but you may improvise with other types, for example romaine as shown in the photo. 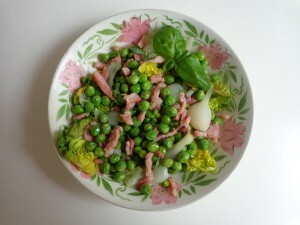 I would steer clear of iceberg lettuce, however, as its crunchiness would clash with the velvety mellowness of the peas. Peel the onions. If using spring onions, cut off most of the greens, leaving about 2 inches (5 cm) of onion and green. If the spring onions are bulbous, cut them in half. If using whole onions, cut into quarters. Cut the bacon into lardons: Remove any rind and slice crosswise into pieces about 1/4 inch (1 cm) wide. If pre-cut lardons are available, it is fine to use them. Heat the olive oil to sizzling in a large pot with a cover. Add the bacon and stir-fry for about 1 minute — the bacon should not brown. Add the onions and sauté for another minute. Add the peas and the water. Turn the heat down to low and cover the pot. While the peas are gently cooking, snip four basil leaves crosswise into thin strips. Reserve a couple more leaves for decoration. Check the peas for tenderness after they’ve been cooking for about 10 minutes. If not ready yet, cook 5 minutes more. When the peas are tender, add the basil, salt, sugar and pepper. Place the lettuce leaves on top, cover the pot and cook 1 minute more, until the lettuce has slightly wilted. Decorate with the extra basil leaves and serve either as a side dish or as a main dish for a light meal, accompanied by a salad. Serves 2. I’m basil dependent after living 20 years in Liguria where pesto is King. Petit pois lyonnais has always been a favourite of mine, but oddly enough I never thought of adding basil till I came across your recipe. Excellent twist on a classic French dish, many thanks!